Digital Library of the University of Łódź, Poland. Joseph Joachim, [1.] Fantasie über ungarische Motive, for violin and orchestra; [2.] Fantasie über irische Motive, for violin and orchestra; [3.] Cadenza (early version) for Beethoven’s Violin Concerto, op. 61; 69 fols., 32.5 x 26.5 cm [autograph ms., before 1853 (ca. 1850)] — H 15849, marked “Joseph-Joachim Nachlaß.” University of Łódź Library. From the Philipp Spitta Collection. See: Christoph Wolff, From Berlin to Łódź: The Spitta Collection Resurfaces, Notes, Second Series, 46/2 (December, 1989): 311-327. The manuscript, which was part of the Joseph Joachim Nachlaß at the Berlin Hochschule für Musik, was sent, along with other materials, to Poland during the Second World War. Christoph Wolff details his discovery of the collection in his 1989 article. “The only manuscript from the Joseph Joachim estate of the Hochschule für Musik, today divided between a smaller part at the Hochschule der Künste Berlin (West) and a larger part at the Deutsche Staatsbibliothek Berlin (East). 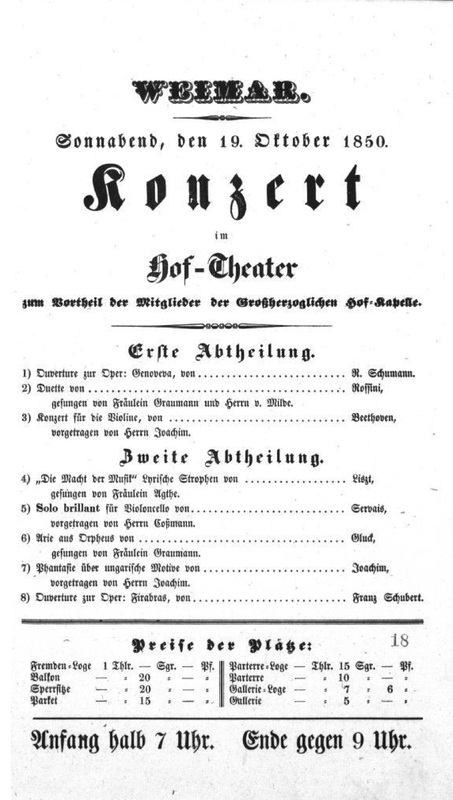 Program for the first performance of the Phantasie über ungarische Motive, woO, Weimar, October 19, 1850. Ref: Landesarchiv Thüringen. HERR JOACHIM’S CONCERT.—This distinguished violinist gave a concert at the Hanover-square Rooms yesterday evening. His principal performance was Beethoven’s Concerto for the violin, in which he was accompanied by a full and excellent orchestra. He played it magnificently in every respect—in tone, style, execution, and expression. At the close of the first movement he introduced a new Cadenza of his own—very long, elaborate, and full of enormous difficulties, which he surmounted triumphantly; but it was more wonderful than pleasing, as it did not seem to flow out of the subject, and was deficient in melody. A Fantasia on Hungarian airs was a most marvelous display of executive power; but Mr. Joachim shines more as a performer than as a composer. His themes had less national character than many Hungarian airs that we have heard, nor was there anything characteristic in his treatment. It was, however, a perfect piece of violin playing, and, as well as his other pieces, was enthusiastically applauded. There was a numerous audience and a great many musical notabilités were present. M. Ferdinand Hiller officiated as conductor, and among other eminent personages in the room, we observed Dr. Spohr and the Chevalier Neukomm. The Morning Chronicle [June 1] compared the Mendelssohn interpretations of the “Teuton” from Prague (!) and the Italian, Sivori, but failed to mention the Fantasia at all. A third performance came on Friday evening, June 11 in a benefit for the Royal Society of Female Musicians. The first modern performance of the Irish (Scottish) Fantasy. See also: Katharina Uhde, “Rediscovering Joseph Joachim’s ‘Hungarian’ and ‘Irish’ [‘Scottish’] fantasias,” The Musical Times, Winter, 2017. Also: Chapter 1, Virtuosity Uncoiled: Two Fantasies Rediscovered; Fantasy on Hungarian Themes (1848–50); Fantasy on Irish [Scottish] Themes (1852) in Katharina Uhde, The Music of Joseph Joachim, Woodbridge: The Boydell Press, 2018, 15-60.